Dichotomies make me very happy. So you can imagine the joy that I found this year in Thanksgivikah. If you don't know, Thanksgivikah was the once-in-a-lifetime experience that just passed us by, where Thanksgiving and the first day of Chanukah came wrapped together in one neat shiny end-of-November package. It was a beautiful creation that inspired many a sad advertising campaign, including William Sonoma's "Latke and Vodka party", and Delish.com's "Challah Pumpkin stuffing" recipe. For the more traditional Jews who like to do their own cooking (like my family), it means we knock out turkey, brisket, and over 400 potato latkes in one action packed weekend. Not a bad break, if you ask me. But in my mind, the whole thing is a contradiction. See, Thanksgiving, at least to me, is the holiday in which we sit down and give thanks for all that we have. And I don't mean the material, I mean the blessings- our family, our health, the things that we've done and seen, the people who have impacted us. It's the dinner where we celebrate the life that we have, the goodness of the Lord and all He has given us, and the things that we often take for granted. We celebrate the day to day- the average- the things we almost have come to consider mundane. And then comes Chanukah, which is a celebration of miracles (at least at it's core). We are meant to remember that even when the odds were against the people of God, He fought on our side and provided, and we won. We were given a chance when no chance was plausible, and we came out victorious against all odds. Twice (once by defeating our enemies, and once by having our offering of the oil be not only accepted, but extended throughout the time when we needed it most. Read more about Chanukah if you are a little lost). We thank God for all the amazement that He has given to us throughout the years, and we even give one another gifts to celebrate the goodness of life's unexpected pleasures. See what I mean? One that celebrates normalcy. One that celebrates the unexpected. Dichotomy. So I really liked Thanksgivikah. I really liked the idea of putting both of the celebrations together. I really like the idea of being thankful, both for everything good that I already have, and every good thing that I have never even expected. It feels hopeful. As if anything is possible, and happiness is abundant and all around. But of course, it led me to wonder why the holidays had to line up for me to start thinking about these things. Why do we wait for the special days to consider what we have? With all the goes on in the country we live in, we risk losing the meaning in a swamp of consumerism and craziness. It's very easy to get caught up in the hustle and bustle of all that goes on and forget the moments of contemplation that remind us of the point. And don't get me wrong, I like the idea of having a day to celebrate the all we've got and are given, but I want to be celebrating all the time. And I don't want to miss out on one because both days feel together. I think that my point is this; there are a lot of things in life that shine through and give us comfort, joy, and happiness. I want to see them in their moments instead of seeing them all at once. I want to be thankful at all times, both for the ordinary and the extraordinary. And I see great potential for this in the future. I'm just thankful that the two holidays came together to remind me of this truth. "Life can get so complicated. All I could ever manage was twenty four hours in a day. I believe I'd have lost my mind if I went on worrying about the minutes..."
I am one of those people who likes to fill in all of my time. I love the feeling of accomplishment I have when I get things done. I sleep better when I go to bed at night knowing that my checklist is fully filled in. That I have left no stone unturned. It doesn't necessarily make me happy, but I feel pretty good about being on track. I get a little crazy about it, actually. And I get very frustrated when my schedule doesn't fall into place. We don't like to think about things we haven't done. We measure our days in terms of productivity and accomplishment: "What did I get done today? How does it fit into my grand plan for life? Did I move towards the goals I think I need to have?" We get worked up when the answers to these simple questions seem uncertain. Or when they feel like negatives. Sometimes even sleep or food or other daily obligations can seem to be obstacles in getting to the end. I mean, even God rested, but sometimes I just have to get whatever-this-is finished. The problem with this deep seeded disappointment is what we miss when we are busy obsessing about all the things we haven't done. Like the blessings each day bring. Or the wonder that is the distractions that stopped us from getting on with our plans in the first place. It's true, sometimes they are nothing more than too much time relaxing, or playing games, or even just giving in to pure exhaustion. But even those things can be just what we need when life gets busy. Last week was rough for me. I had a lot I needed to work on waiting for me. Blog by wednesday, get my lesson plans done by saturday, start my new testament reading plan, finish the book on Job I've been reading, design business cards, get back to the four-days-at-the-gym routine... there were more, but I think you get the idea. A million goals. But upon reflection, last week was not a waste of time at all. No, I didn't finish my book on Job, but I did finish a fiction novel that gave me some perspective I was missing. I didn't get to the gym enough, but I had an awesome time of bonding with a close friend. My lesson plans didn't get finished, but I gained some real life experience that will do more for my writing style than even writing ever would. There was so much good that came out of my life last week... and instead of enjoying it, I was busy falling into the stress of the lie that my own plan was the only way to go. I needed to be reminded that my plan wasn't even the important one. God's was. And last week fell right into His design. This new week has begun, and I have to tell you, it's only Monday, and I am well on my way to getting done everything I missed last week, plus the list that I have for this one. But I am thankful for the healthy reminder that ultimately, the grand scheme is out of my hands. I talk about wanting to be all that God wants me to be, and only what He wants me to be, and it reminds me that I have to get in line with His will 100%. That may include giving up things that have shaped my view of what my life needs to look like. But so be it- when we fully commit, we sign that deal. Thankfully, God doesn't waste time. He doesn't have hours in a day that are uncounted for. He doesn't take a few minutes to "rest His eyes". He doesn't hide away when the moments get overwhelming; actually, He doesn't even get overwhelmed with His to do list. And He has a lot to be accountable for. But every moment is considered by God. And He does it all without an administrative assistant. From now on, I want to measure my moments only in God's time. I want to be reminded that everything we do has a purpose and a path. The only way to waste time is to mourn over it, and to fight against it. All the moments we are given are a gift. I won't squander it by stressing over it anymore. "I always liked strange characters." I didn't want to like Death, but it was inevitable. Before you all get freaked out, I am talking about Death, the narrator of "The Book Thief", a young adult read that has just been released into theaters. A friend recommended it while I was describing the excellence of the demon narrator in C.S. Lewis's "The Screwtape Letters." He warned me that story was told from the perspective of Death himself, and I picked it up expecting an unlikeably angry and sadistic character. But he isn't written as such; Instead, he is portrayed as a calm voice, seemingly tired and a little sad. He weaves the story in a way that makes the reader understand the beauty of life from the perspective of the one who separates it. I didn't want to like him, of course, but he really is a compelling character. I am an avid reader. All my life I have been taken in by stories, feeling myself fall into the fantasy world that words capture. I can't sit through too many movies, based on a short attention span, but a book is different- it requires your eyes and your mind to align and work together, and suddenly, your other senses are feeling all the same things the characters are. You are living in their world, hearing their thoughts and actions and hopes and fears, and until something breaks the spell... it's a wonderful thing. And since you become so intimate with these characters, you start to develop feelings and emotions toward them- some you fall in love with, and some you can't stand. I find that the more I read and get to know these personalities, the less I can control how I feel about them. Even when the writer finds the character wholly unlikeable (if you read interviews, you find which characters were favored, and which where despised), I sometimes find myself with a conflicting opinions. I don't know when, but somewhere along the line, I stopped choosing which characters I like. They started to choose me. 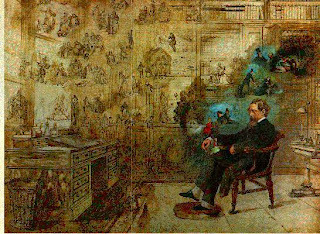 There is a painting called "Charles Dickens in his Study" made by Robert William Buss. In it, the great writer is surrounded by a number of his characters, swirling around his head. His eyes are closed, and he is leaning in a chair. I feel for him, because I wonder what his characters are saying to him. Does he love them? Hate them? Want them to shut up so he can focus on their antagonists? I imagine they speak to him very loudly. I just wish I knew what he would say back. In our lives, we are all parts of the great story written by a grand Creator. He loves us all equally and greatly, but He didn't make us to like all the others. We live in a world where the term "enemies" is a reality. One of my missions in life is to love everyone, and it's hard. And it doesn't mean I have to like them. But I wonder what it is that draws us to people. Why do we regard them? What connection is that we can make with even the most unsettling of souls that causes us to relate? I wonder sometimes if there is a formula for making friends (and it's a joke they've even made on television shows, so I know it isn't just me). It would have to be an individual formula. Something in us + something in them = bonding. As for myself, I find that I appreciate honest people more than kind people or socially intelligent people. But I don't know why this value strikes me. How does the scale work? What is the top quality? Is it consistent? Does it change with age? But I think, now, in light of this new affiliation to a charter such as Death, that maybe it's better we can't deduce what makes us attracted to others. Perhaps, as with many other formulas, it would narrow down our vision and box us in. We might never be able to get past our own ideas of why we should be friends, and that would hinder us from making new realizations about others, and in turn, about ourselves and who we are. We don't get to choose who we like, but maybe that's a good thing. Maybe that's what stops us from discrimination internally, and helps us to recognize the good in others. And maybe, just maybe, it makes us a little more human. Above my bed hangs a large picture of the John Lennon Memorial that sits in Central Park (pictured below). 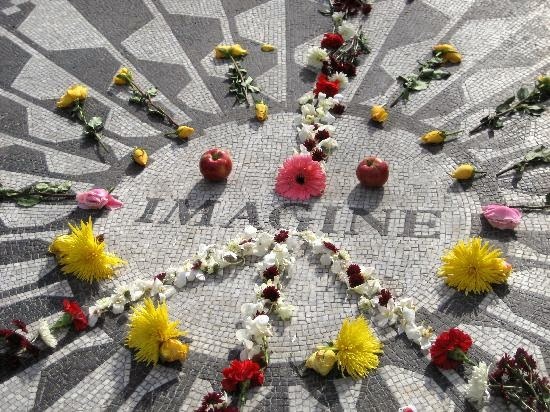 The stone homage is a large reminder of the message of peace that Lennon wrote into one of his most famous pieces. It drives my mother (and many other people) a little crazy, because the song, in an attempt to draw a picture of a new world, suggests imagining that there is no God and no religion as one of the ways to abolish conflict and separation. I do not, as you probably anticipated, want to imagine a world where there is no God, nor do I believe that such a world would be a peaceful place. However, Lennon's refrain strikes something deeply in me. When all the world dreams together, we can start to make a difference. I am a dreamer. The worst kind of dreamer. I can zone out in the middle of almost any setting and start re-writing the human story in my head. I can imagine rallies against hatred, and small gestures changing the course of a life. I mentally construct scenarios in which something fantastic happens as a result of the inconsequential details of life. And I long for these things to happen on the day-to-day. But the execution is a struggle. People are a bit narrow-minded by nature. We have this idea of how the world works, and we cannot imagine the greatness or the vastness it truly entails. We worry about little changes- small term things that won't affect the end of our story greatly- on a daily basis. When we think of big change, or of impacting people on a grand scale, it makes us queasy. When we have an idea that we think might be earth shattering, we are frustrated that other's are not already on the same page with us. We don't see ourselves as the catalysts of major twists in the story, and often, when we can see it, it depresses us. When it becomes my turn to stand up for something I believe in, or something that I believe is important, I want to be ready, to be willing, and to be able to go without regard for cost or outcome.. I want to be the kind of person who contributes to something huge- I don't really have a desire to be remembered, but I want to be part of a movement that goes down in history. I want to be the kind of person who lives as big as I dream. Recently I attended a messianic non-ference called "Grassroots." It is the love child of like minded people who want to see what God can do when they put aside their differences and just spend time together. Being there was a beautiful experience for me, not just because of what was said by the speakers or the time spent worshiping together, but because there was a grand sense of belonging that came from sharing hearts. I sat with a woman named Dorothy (read what she writes here) who told me how she was learning to listen, and it struck me that others might be learning the same lessons that I am. The dream that Grassroots embodied became a reality for me in that moment. We covered a lot of ground over dinner, from how to serve people properly to how to live each day. And something about just finding our similarities connected us. Maybe you are dreaming of something on a grand scale. Maybe you share my picture of a worldwide movement of peace, harmony, and truth. (And love- for me, it's always love). Or maybe you are dreaming of something smaller; a kind of life you want to live, a relationship you want to have, an accomplishment that you want to see. Whatever it is, I believe we are all dreamers, waiting on the hope of something that we have not yet seen happen. Which is also, incidentally, the definition of faith. Be faithful. Keep dreaming. Let's get a little closer to creating something new. It's alarming how quickly we forget that nothing's bigger than love. I don't love the right way. Forget romantic love for just a second, because that is an entirely different conversation. I'm talking about the day-to-day love, the kind that slips into conversation pretty regularly: "Oh, haven't you met (enter name of person you met last friday here)? She's great! I love her!" It's almost grotesque how easily our emotions become attached to other human beings. And that's all good, but it's not enough. Because we learn to love based on the goodness we see in a person. We put on rose colored goggles the first time we meet them based on the things that draw us in the first place. And then, when some time has passed and new things have been revealed, we weigh their bad qualities against those things when we liked. The conversation starts to sound like "Oh, well I know she can be a little racist, but she's great with kids!" or some equally ridiculous statement that justifies our affinity for our friends. And this is the key- justice. "There is something deeply satisfying about justice. We love it when right is rewarded and wrong is punished. The old axiom, 'Justice is truth in action' explains our love for it; what is fair finally occurs." Sometimes we love justice much more than we love people. We like to see our scales balance out with what we think is right, and it takes control of our thoughts, especially when it comes to figuring out how to love people. And the worst part is that when we do find someone that we can love despite all the things we can't stand, we feel accomplished. Proud. As if we are super human for being able to get out of own heads and assess them honestly and still come out feeling good things towards them. As if we've done something right. Ideally, we would learn the truth about what is just, and as a result, maybe we could continue to hold the good and the bad up in the light. Of course, before we can even begin to make these assessments, we would have to understand the whole picture- the whys and hows and whats that make people who they are, and even more so, what they are perceived to be. To be honest with you, it sounds terribly tiring to me to have to look at the big picture for everyone... I think I have a better solution. I want to love all people without justice. Leave the fairness up to the God who created the system in the first place, and love unconditionally instead. Find the fondness for their faults that I find for what I perceive to be their greatest qualities. I want them to feel grace overwhelm them. I want to see beyond the pleasing part of the picture and love people wholly. And I want to do it without pride, because let's face it, the accomplishment isn't in learning to love someone, it's in getting away from my own twisted self long enough to realize it's not up to me to implement rulings or fairness or even mercy on anyone else's life. I haven't even mastered it in my own. And the only one I want residing over me is God. And so love speaks truth. And justice is truth in action. It is not an easy thing to forgo justice for entire love. But it's the way I want to love- the way I want to be loved, too. I don't want someone assessing my good and bad- I want them to see me in all that I am and still want to spend time with me. Do unto others rings loudly in my ears. I'm telling you, I've been loving wrong. Maybe we can all learn together. Maybe we can support each other until we have stopped loving people "as long as" or "because". And maybe in this, we'll remember what a catalyst of great change love can be, and we'll see change in the world around us. It's a thought that makes me feel hopeful for humanity, really. Starting now, I am committed to learning how to love properly. Life is full of beginnings- of defining moments where change stops being a thought and starts being the new way to live. Some of these beginnings are chosen, some are handed over, and some are hard to stomach. But each of these beginnings is a step in shaping us into something new we will become. This is a new beginning for Red Sky At Mourning- a new look and feel, a new outline, but most importantly, a new heart for the writer. A year ago, when I stopped writing these messages to you, readers, I was dealing with two major life changes that had lead me to question who I was and what I was sharing. The first major life change had happened almost a year before, when our home was flooded and part of our foundation destroyed in hurricane Irene. The devastation that is brought on by watching part of your home wash away while you are paddled out on a little life raft is hard to describe. I had spent the year cleaning and rebuilding the life I had known before, desperately clinging to the hope that normal would return. And just when the anxiety that rainstorms had begun to bring began to subside, we found ourselves facing yet another hurricane season, and my heart was starting to feel a little faint. The second major change took me from a little faint to broken. A good friend of mine fell down, hit his head, and passed away suddenly. The rocky world as I knew it became a sudden place of sadness. Life started to feel overwhelmingly short, and hard to fathom. And though I clung strong to the Creator, I felt very small and a little lost. And so these two major changes made me realize that I needed to stop writing for a while so I could take some time to learn. I wanted to get closer with God and what He had for me, but I also wanted to get reacquainted with myself, not just as a writer, but as a whole person. I wanted to be strengthened and changed and made new through the knowledge of the Lord, who I was starting to realize, was very very awesome in the midst of a terrifyingly chaotic world. And I was once again on a raft in the middle of the flood waters, but instead of feeling sorry or hurt, I was learning strength and trust. I came back to you now with another new beginning- this time for Red Sky, for the hopes that I had when I first started writing back in 2011. In my time away, I have learned three invaluable lessons that I believe will shape this next stage of my heart as I pour it out on to these webpages. Lesson 1: Much of what we do and who we are is shaped by fear. We can almost always look back on mistakes we've made and ask ourselves, "what was I afraid of?" We can do the same for others. It is the first step to understanding what makes a person up. Lesson 2: Understanding a person is essential to loving them wholeheartedly. When we see someone in their entirety, and love them the same way, we open up the opportunity for changes in ourselves, and in each other, that may have never have seemed possible. Lesson 3: Even things that don't seem possible are easily attainable for God. (You may have known this already, but I needed some prompting). The world boxes God unintentionally- we limit Him without even knowing that is what we are doing. I have learned that the remedy for this is only to ask Him to make my heart and His match- to make us have the same desires, the same eyes, and the same hope. This frightening lesson was the one that most prompted me to come back to you, readers, and start new. Red Sky has a new look, a simpler look, and I hope it will hold new messages that will touch both your heart and mine. All the older entries are still in the archives for anyone who might like to look back as well- as for me, I am looking forward. And I am looking forward to sharing my heart with you again.